The excellent weather conditions during the past week has resulted in good progress in Trench 2. Read on for the latest update. Due to other work commitments, excavations in Trench 2 were only carried out on the 18th, 19th and 21st of April. However, the fine, dry and sunny weather conditions allowed good progress on these days, with the removal of Context C205 in the entrance shaft and the recovery of some new finds. 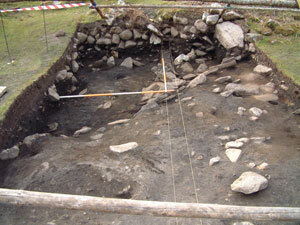 The excavation of the back-fill from the former entrance to Bone Passage continues to reveal some intriguing results. 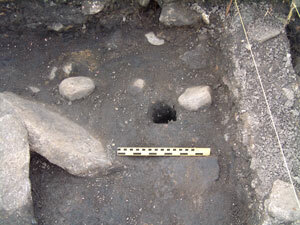 As we go deeper into the entrance the fill shows little change, comprising fire-cracked stone, charcoal and burnt bone. However, we are starting to find a few fragments of unburnt bone and teeth from animals, while some of the charcoal fragments are quite large. As we excavate the fill we are also finding some interesting features such as the paving slabs that appear to be tilting into the shaft, most likely due to subsidence, and a large hearth setting that rests directly on top of these slabs. 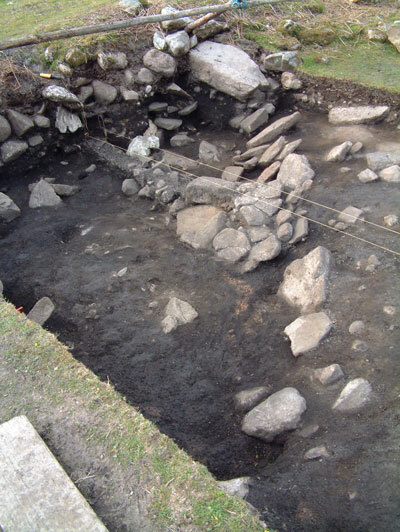 The slabs may be the remains of a paved surface constructed after the back-filling of the former entrance into the cave, on which was built the hearth setting. Evidence for burning on this hearth has been recovered including large chunks of charcoal, some burnt bone and peat ash deposits (see below). We have also uncovered more small voids during this weeks excavations in Trench 2, some of which go down into the fill of the entrance for 0.5 metres. We must be getting close now to the actual entrance, but what form will it take? Will we find a natural rift in the limestone bedrock, or will we find a more elaborate entrance with steps and drystone walling? Keep visiting the website to see our latest updates. We have continued to uncover some new finds during the past week including burnt and unburnt bone, charred cereal grains, burnt hazelnut shell, pottery sherds and a limestone loom weight or net sinker. The mounds of fire-cracked stone and pebbles recovered from Trench 2 also continue to grow, indicating some serious cooking activities taking place on site in prehistory! 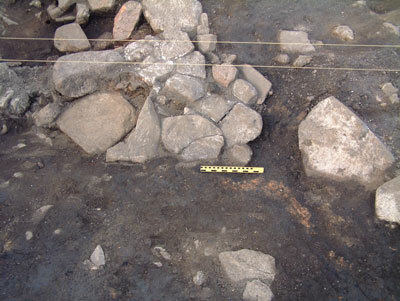 Figure 5 - The piles of fire-cracked stone and pebbles from Trench 2. 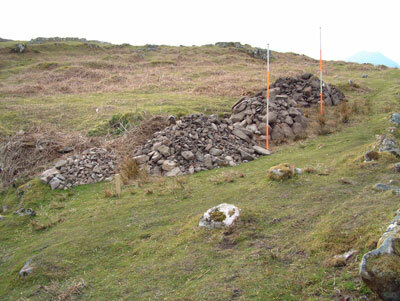 The different mounds relate to the different contexts we have excavated from the trench - ie C201, C202, C203 and C205 (in order from left to right in the image).